The study, "Carbonate-sensitive phytotransferrin controls high-affinity iron uptake in diatoms," was funded by the National Science Foundation, the Gordon and Betty Moore Foundation, and the U.S. Department of Energy. It reveals an unexpected twist to the theory of how iron controls the growth of phytoplankton. By showing how the loss of seawater carbonate hampers the ability of phytoplankton to grab onto iron, the authors show a direct connection between the effects of ocean acidification and the health of phytoplankton at the base of the marine food chain. "Ultimately our study reveals the possibility of a 'feedback mechanism' operating in parts of the ocean where iron already constrains the growth of phytoplankton," said Jeff McQuaid, lead author of the study who made the discoveries as a PhD student at Scripps Oceanography. "In these regions, high concentrations of atmospheric CO2 could decrease phytoplankton growth, restricting the ability of the ocean to absorb CO2 and thus leading to ever higher concentrations of CO2 accumulating in the atmosphere." "Studies investigating the effects of high CO2 on phytoplankton growth have shown mixed results to date. 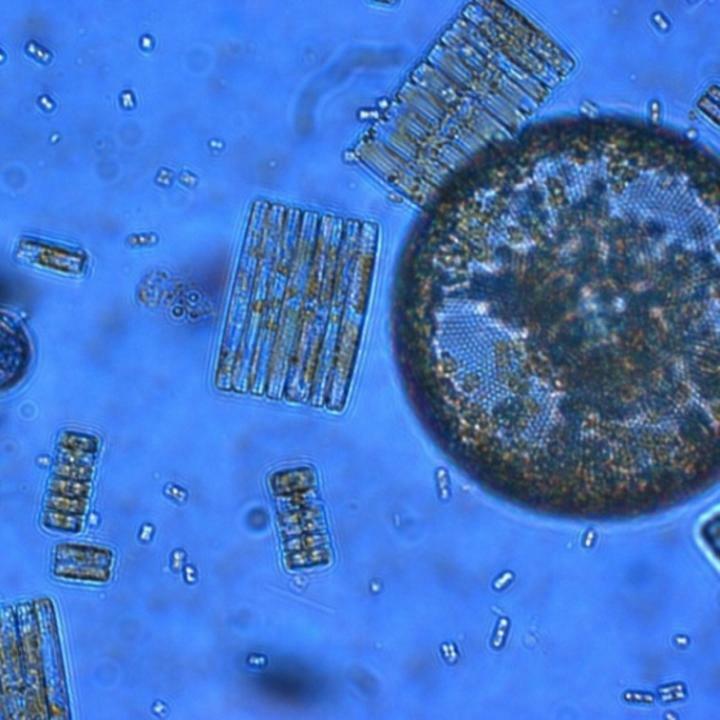 In some cases, certain phytoplankton seem to benefit from high CO2," added Andrew E. Allen, a biologist with a joint appointment at Scripps and JCVI who is senior author and initiator of the study. "Most of these studies, however, have been conducted under high-iron conditions. Our study uncovers a widespread cellular mechanism that suggests high CO2 might be particularly problematic for phytoplankton growth in low-iron regions of the ocean." "Understanding the mechanism of iron uptake is critical to develop meaningful predictions on how phytoplankton may respond to future ocean conditions, but this understanding has been elusive," said Adam Kustka, a trace metal physiologist and project collaborator from Rutgers University. Clues began to emerge in 2008, when Allen discovered several iron-responsive genes in diatoms that had no known function. That same year, McQuaid was traveling around East Antarctica assisting in a survey of plankton in the Southern Ocean. DNA analysis of those samples revealed that one of Allen's iron genes was not only present in every sample of seawater, but every major phytoplankton group in the Southern Ocean seemed to have a copy. "This gene, called ISIP2A, was one of the most abundantly transcribed genes in low-iron Southern Ocean, suggesting it had a really important role in the environment," said Allen. Earlier studies suggested a transferrin-like protein, called phytotransferrin, was at work in the marine environment, but ISIP2A looked nothing like transferrin. It took the development of an entirely new discipline, synthetic biology, to help prove the team's hypothesis that ISIP2A was a type of transferrin. Synthetic biology is the fusion of biology and engineering, and in collaboration with scientists with the Venter Institute, the team developed methods to insert synthetic DNA into a marine diatom. The scientists deleted ISIP2A and replaced it with a synthetic gene for human transferrin, demonstrating that ISIP2A was a type of transferrin. "The appearance of phytotransferrin some 700 million years ago is consistent with a time in Earth's history marked by massive changes in ocean chemistry, and this ancient evolutionary history helps explain why no one has connected ISIP2A and transferrin," said Miroslav Oborník, a molecular evolutionary biologist from the University of South Bohemia and co-author on the paper. "Since carbonate and iron have to bind simultaneously, as carbonate concentrations drop, phytotransferrin is able to 'see' less iron," said McQuaid. "The total amount of iron isn't changing – rather the ability to grab onto it changes, and this ultimately influences the growth rate." The international research team also included Theodor Kindeberg, Andreas Andersson, and Katherine Barbeau from Scripps Oceanography in addition to McQuaid and Allen; Aleš Horák from Biology Centre ASCR, Institute of Parasitology and University of South Bohemia, Czech Republic; and John P. McCrow, Bogumil J. Karas, and Hong Zheng from JCVI.